An Orthodontic Instrument Repair Service Unlike Any Other. Since 1993, Precision Plier Service has been recognized as the gold standard for premium quality orthodontic instrument repair by orthodontic manufacturers, distributors and thousands of orthodontists throughout the world. Why has Precision Plier Service long been the orthodontic industries 1st choice for premium quality orthodontic instrument repair? It starts with our craftsmen; together they have an unprecedented 95 years of experience servicing and repairing orthodontic instruments exclusively, all types of orthodontic instruments from every orthodontic instrument manufacturer. Their skills are simply unparalleled. No other company on the planet is more qualified and experienced in orthodontic instrument repair. We remain true to our time honored tradition of quality and customer care while maintaining a critical eye on the things that truly separate us from others in our space. In fact, our attention to detail, superior craftsmanship and use of the highest quality materials available is why more orthodontists turn to us as an affordable alternative to purchasing new orthodontic instruments. Our service cost up to 85% less than buying new pliers! Today, we're so proud that thousands of orthodontic professionals both in the United States and abroad, and more than 30 orthodontic manufacturers and distributors in over 25 countries, choose Precision Plier Service to keep their orthodontic instruments in top working order! We invite you to discover for yourself why Precision Plier Service is the most respected, experienced and trusted orthodontic instrument service company on the planet. With Precision Plier Service you'll save up to 85% versus new pliers. 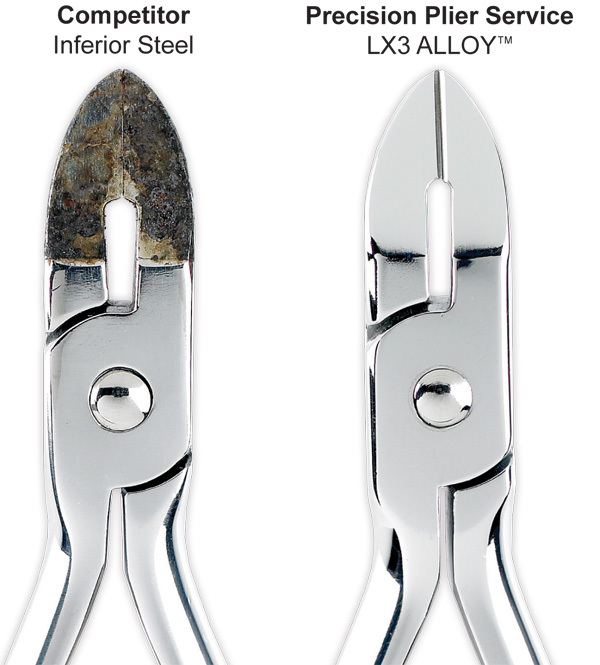 When you choose Precision Plier Service you'll receive free re-tips with our exclusive corrosion resistant LX3 Alloy™, free inbound shipping, and same-day turnaround upon request. And to ensure timely service, consistent quality and precision, all services are proudly performed in-house. Precision Plier Service is the world's 1st orthodontic plier repair company and the only company trusted my orthodontic instrument manufacturers. The expert craftsmen at Precision Plier Service posses an unprecedented 95 years combined experience servicing orthodontic instruments exclusively. Today Precision Plier Service proudly stands as the only company to specialize in orthodontic instrument sharpening, re-tipping, and repair, all types of orthodontic pliers from every orthodontic plier manufacturer. Every orthodontic instrument we service is guaranteed to perform like new. If you're ever less than 100% satisfied simply return the item and we'll repair it again free of charge. This bold guarantee is only offered by Precision Plier Service and is achieved through our unparalleled experience, workmanship, and exacting standards. Other Companies Just Don't Cut It. Orthodontic instrument repair is a specialized service that should only be performed by experts. Choosing the wrong company to repair your orthodontic pliers could result in irreparable damage eliminating the possibility of future repair. Precision Plier Service guarantees a "like new" repair that won't damage or compromise the integrity of your orthodontic instruments. LX3 Alloy™ is the result of our endless dedication to quality and our promise to deliver the world's best orthodontic instrument repair. Our exclusive LX3 Alloy™ will not tarnish like the inferior steels that are commonly used by our competitors. This results in a repair that lasts up to three times longer. We have had our orthodontic pliers sharpened several times and every time, they come back looking and cutting like new. I continue to be impressed with Precision Plier Service as a company and am overly pleased with the service. Doctor was thrilled to have his instruments back in tip-top performance and in shape to practice ortho again. Not only did you meet my expectations, you exceeded them. 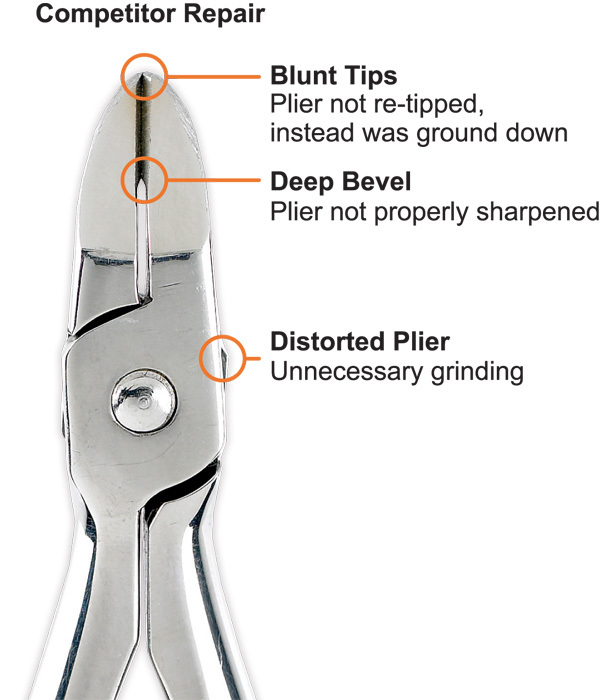 Precision Plier Service is a company that takes pride in the turnaround time in which they get the pliers repaired. The quality is awesome and the price is fair. Thank you Precision Pliers for your excellent service. Our latest repair was great, it was sent back within just a few business days, very prompt. The employees at Precision Plier Service are very friendly; great at following up on repair services; and very helpful. Our orthodontic instruments were sent back to us in a very timely manner. We are very happy with your service the instruments are indeed up to our satisfaction. Precision Plier Service has excellent customer service and great turnaround time. Our pliers always return in a timely fashion and in great condition. We really enjoy doing business with Precision Plier Service. I want to thank Precision Plier Service for the great service you provide to our office, your turnaround time is great and I appreciate how fast, friendly and efficient your customer service is. Your team is awesome and very courteous. Great job ladies and gents keep rocking. Our pliers that we receive back from you work great. Thanks for your service. We have been sending our ortho plier repairs to Precision Plier Service for the last several years with no complaints. Your quality of work has been flawless. As a specialist in orthodontics you wouldn't advise a patient to hire a general dentist to treat a specialized orthodontia case - so why would consider trusting a company that doesn’t specialize in orthodontic instrument repair to service your valuable orthodontic instruments? After all, just because someone has the ability to sharpen saw blades, toenail clippers, or beautician scissors doesn't mean they’re qualified to repair orthodontic instruments. Orthodontic instrument repair is a highly specialized process that should only be performed by experienced professionals that know precisely how an orthodontic instrument should perform and posses the expertise to deliver like new results that won’t compromise the integrity of your orthodontic instruments. Trust the orthodontic instrument repair specialists, trust Precision Plier Service. © 2018 Copyright Precision Plier Service. All Rights Reserved.